Mehndi is an essential part of the Indian culture. There are different varieties and designs of Mehndi art and one of the most beautiful and intricate mehndi art form is “Rajasthani Mehndi”. These mehndi designs mainly represent the folk, dance, tradition and the colours of the Rajasthani culture. A close look at these designs shows the unique representations of henna by the use of flowers, leaves (especially mango leaves), peacock shaped designs etc which reflect the Indian culture and tradition. The most unique part of the Rajasthani mehandi design is the “mirror reflecting art. In this type of the art form, the designs of both the hands and legs are exactly the same, thus they are mirror images of each other. That is why the Rajasthani mehendi designs are considered to be the most difficult art form. 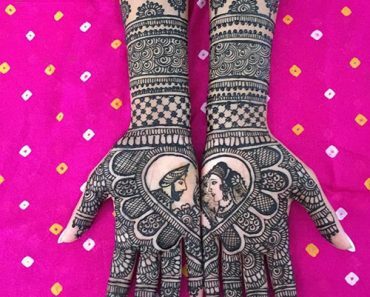 You can see the typical “mirror reflecting” designs, where the mehandi design on both the hands is identical. You can also see traditional motifs like mango leaf border which is filled with small squares. The heart shaped pattern adds a very modern touch to it. This design is suitable for any household function and weddings. The design can extended to the entire length of the hand, making it very suitable for the bride!!! In this design, the traditional motifs like flowers have not been used. Instead the entire palm is covered with leaf designs and tip of the fingers are completely filled with henna. The design on the hand is kept very basic with only angular designs. 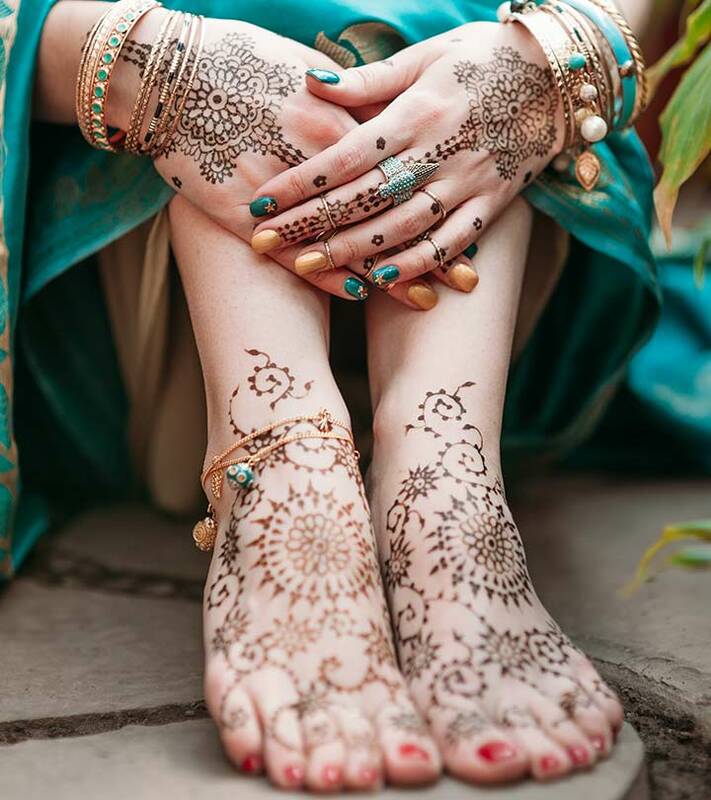 During marriages, the bride’s feet are decorated with beautiful henna designs for certain ceremonies focus on the feet of the bride. In this, the entire feet are covered with the veil sheet pattern with traditional peacock motifs till the calf. 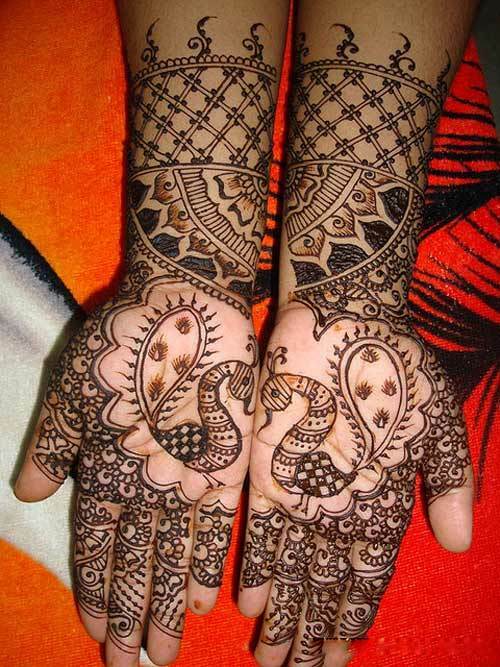 If you have thin and long palm, then this mehndi design is suitable for you. The palm is completely filled with very intricate veil sheets, flowers and leaves. 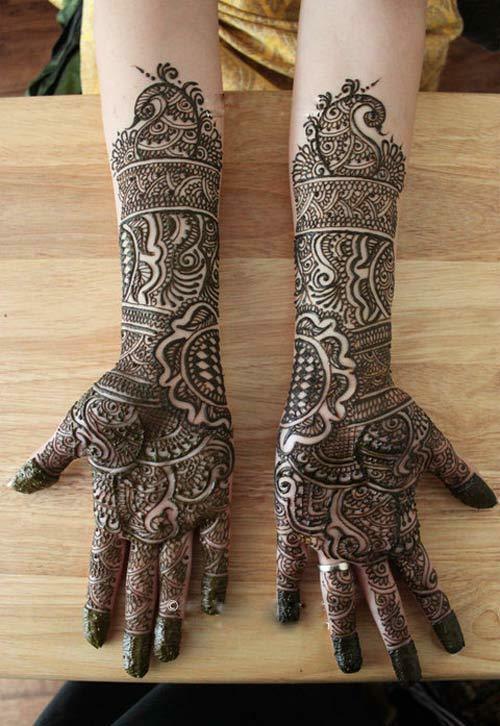 One can opt for black mehndi for this, as it will enhance the design in a better way. However you won’t find the mirror reflection art form in this typical design. 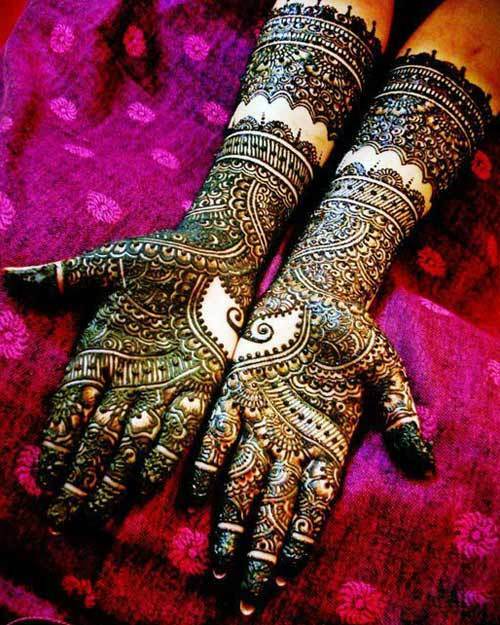 This Rajasthani mehndi design for hands is ideal for any occasion. A big flower motif along with the leaves on top and bottom dominate this design. The sides of the palms are covered with veil sheet design which extends till the length of the hands. The tips of the fingers are covered with extended leaves and decorated elephants on both the ends giving it a traditional Rajasthani look. This mehendi design is apt for any occasion like weddings and can be applied by the bride and her relatives too. 6. 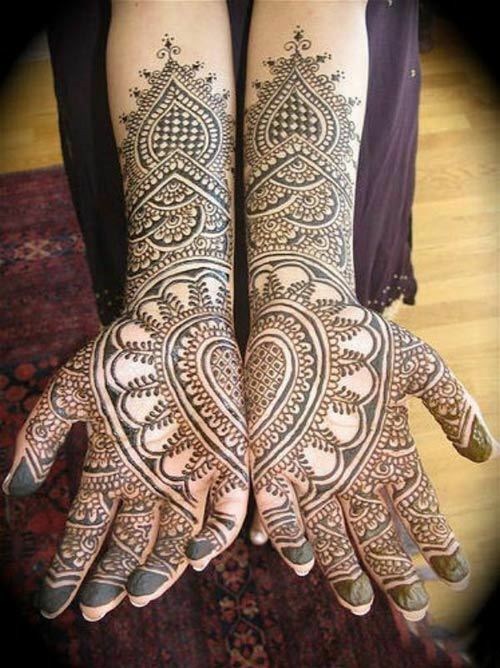 This is the typical Rajasthani mehndi design for full hands with very intricate details. In the left hand, an image of a Rajasthani prince is drawn which represents the groom. In the right hand, an image of the princess is drawn, which represents the bride. The tips of the fingers are left open. 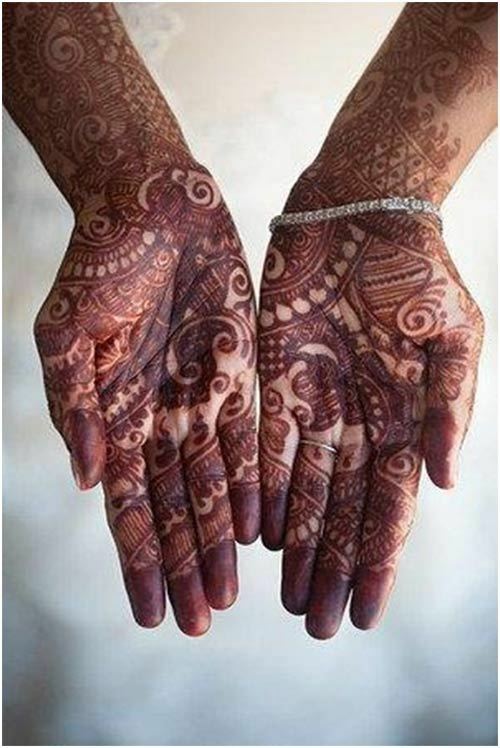 This is the best possible bridal mehndi, which goes onto the entire length of the hand. The feet of the bride is also decorated with veil sheets and bird motifs. 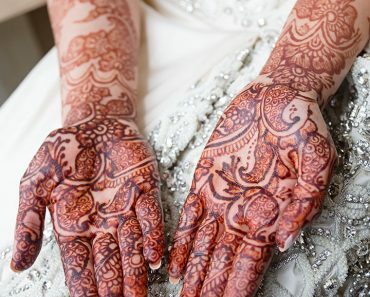 The feet of the bride is also covered with henna in the wedding, making this mehendi design an ideal choice. It covers the entire feet till the calf and one can see the mirror reflecting design. One can paint the nails matching the outfit of the day. A peacock motif dominates this beautiful and elegant. 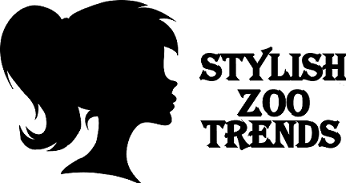 The design is kept simple without looking messy, making it ideal for every occasion. This heavy mehndi design is made completely with the help of angular patterns and filled up with very intricate details. 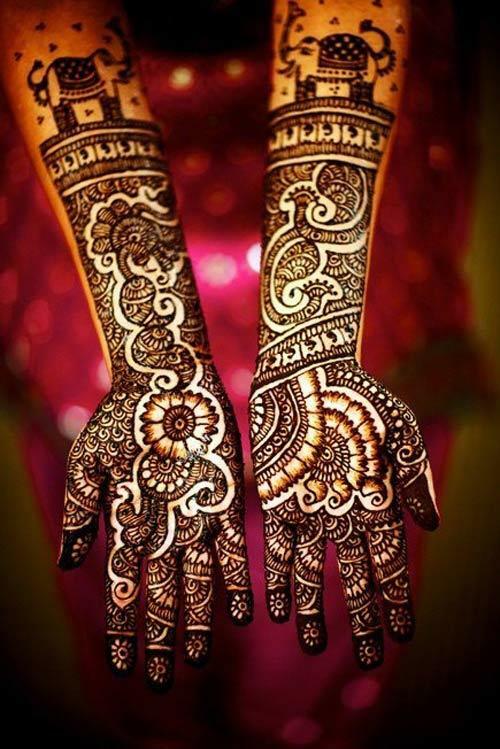 One should opt for black or red henna to enhance the design. You can also add some coloured stones to make your design look unique and beautiful. 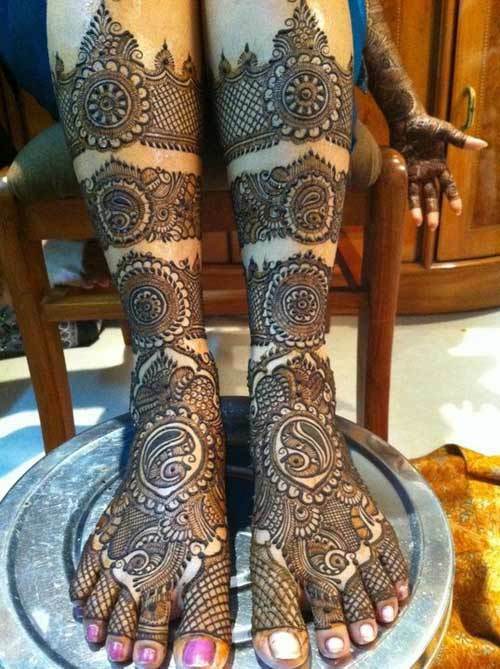 Another Rajasthani mehndi design for the feet which is ideal for the brides. Bands have been created with big circular motifs in the middle. The rest of the feet are covered with peacock pattern and veil sheet design.